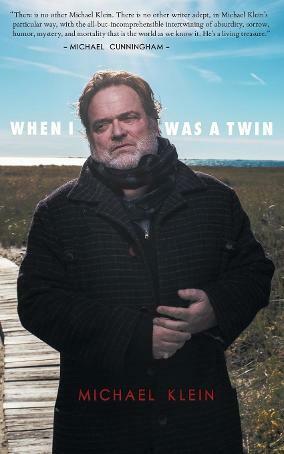 Michael Klein’s most recent collection of poetry, When I Was a Twin, is a long walk through grief and observation toward a state of existence that does not include his twin brother, Kevin. The structure of the poems, with many of them in long, prosaic lines, speaks to the struggle we often find ourselves in as we wind our way out of grief and loss. But don’t let the structure turn you off. As much as Klein is mourning the death of his brother, he is also battling the realization that he could just as easily have been the twin who died: both brothers were alcoholics; one found sobriety and one didn’t. Each poem presents keen observations on the demons we each face and the ways in which we cope. and can’t change clothes in either locker room. except extent. But there’s a lot more death since you died. Klein presents a scene and through the first few lines, the camera shifts for us to see Bruce subtly change to Sheila. Klein doesn’t even have to describe the physical person for us to see the shift; it’s represented in the fact that she can’t change clothes in the locker room. Then he throws in the line “She’s between two rooms of time,” and suddenly the camera has zoomed out. There’s the literal scene of a body standing between two doors, but what makes that line resonate is most everyone has felt suspended at one point or another. The rest of the stanza reiterates the feeling for us. The focus shifts from Sheila to the bigger picture of the country: the same, but different. Nothing changes. These aren’t totally new ideas, “except extent. But there’s a lot more death since you died.” The chord has been struck and the tone is set. Klein’s ability to include brief statements that create a shift in his poems, shifts in scene and shifts away from or closer to the physical body, are what hook the reader. They also work to balance the prose structure of many of the poems. going in my living and in my writing. than I could feel him in our living. Here Klein exhibits an honesty that many might not realize or admit to having. He pinpoints what kept him from being the brother that died: his mentality. In a life where two people are so similar in so many ways, something so basic and intrinsic is what separates them. This realization is what drives the grief Klein experiences through the entire collection. as though a piece of me had died—not all of me, just a piece. fact, died? But I was sure. Kevin was dead. I was alive. When I was a twin Kevin was alive. These lines add more layers to the grief. Of all the things Klein considers, the realization that he is now an independent entity is the one that weighs him and the reader down. Why is that? Throughout this poem, and others in the collection, we start to see that being a twin was, in many ways, a burden. The longer poems in the collection, long in line length and page length, are balanced by what we might consider more “traditional” poems, in terms of shorter, more deliberate line breaks. These poems work to indicate shifts and movement through the grief. They move toward a kind of peace. They also tend to focus less on the brother and more on love. Many poems throughout the collection, regardless of structure, address queer issues and queer love, but poems like “Pentimento” work to highlight that love in a way the longer poems often do not. emerged out from under yourself. I almost had his name. And yours. “Pentimento” represents the doubling that is layered throughout the entire collection. Is Klein literally seeing a past love or someone who looks like a past love? Is he latching onto the person or certain qualities and mannerisms that take him to a former time? Is he grieving the death of his brother, grieving the fact that he survived, or grieving the fact that he always knew he would be the one to survive? Is he even grieving at all? Read this beautiful collection and decide for yourself. Savannah Sipple is a writer from eastern Kentucky. Her essay "Like it Never Happened..." was published on Quaint Magazine's blog and was featured as one of 2015's Transformative Literary Essays by Sundress Publications. Savannah's poems and short stories have recently been published in Appalachian Heritage, The Pikeville Review, Southern Indiana Review, Still: The Journal, and in the anthology Appalachia Now: Short Stories of Contemporary Appalachia. She is also a writer and co-creator at Structure and Style.